08:30. Mondays forecast was for a sunny day today. In the event it is fine but cloudy and not especially warm. Jim expects that the day will be spent exposing the skeletons which have already been revealed and seeking others in the central part of Trench A. Jo and Trevor would continue in Trench E and look beneath the level at which the stones were found. Work in Trench E has not revealed anything new. In Trench A a number of skeletons are now well exposed but nothing has been found in the central area of the trench. Good news for Lyn. The skeleton she exposed yesterday now appears to be an adult not a child. 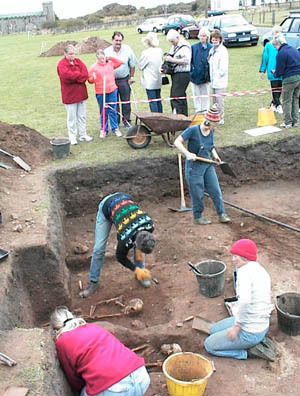 However, her feelings and comments that there was a whole human dimension to the whole dig was well expressed and the skeletons are treated with respect during every part of the exhumation process. They will also be re-buried with dignity. Trench A: The two photograghs above were taken at the east wall. Left:The picture on the left looks northwards along the trench. At the south side there is a slightly exposed skeleton (C3); a skull (C4); the empty grave of skeleton C1 which was removed on Friday; two new skeletons (C5 and C6) and the empty grave of skeleton C2. 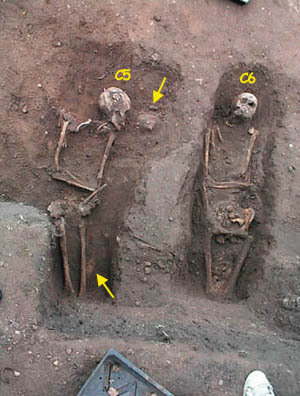 Right:C5 looks to be buried front-down and the arrows indicate the skull and leg bone of a skeleton beneath. Skelton C6 is buried on its back and there may also be bones present from a skeleton beneath - though this will be best confirmed when C6 is lifted. The whole picture created above is one of some confusion to the novice. Were family members buried together in graves or is it just chance that the skeleton beneath were buried and then at a later date the unmarked ground was used again to bury an unrelated body? How do the ages of the skeletons compare with one another? A piece of pottery was found in the grave of skeleton C5. A first sight assessment from Jim is that it could be around 11th century. 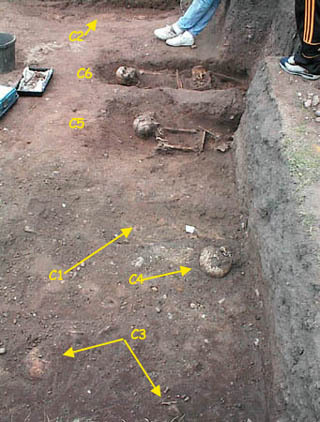 This might indicate a sequence of burials over a long period of time. 15:30. The skull (A1) in the south-west corner of Trench A has been further exposed to show the skull and some backbone. More of the skeleton may be hidden within the walls of the trench. It is noticeable that so far the central portion of Trench A has revealed no skeletons at all. News of Dig'99 has spread and the number of visitors to the site is increasing daily. Trench A: More visitors are arriving daily and following progress. Some of todays visitor were from New Zealand. "Nice ta see ya folks!" One of the new attractions on the site is Jenny's sweater. At first sight it just looks colourful but closer examination shows it to be a "magic ganzie" for repelling rain. Note the coloured umbrellas - row after row of them. You've seen the weather forecast if Jenny is wearing the sweater tomorrow AND it doesn't rain then it's magical powered will have been verified. Note that Fiona and Liz both wore their hats today - neither found any new skeletons or other items. 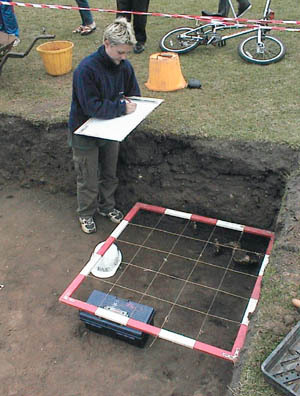 Niall announced that the work at Dig'99 has attracted the attention of the BBC TV Archaeology team "Meet the Ancestors". They'll be on site on Thursday. Tomorrow the JCB returns. We'll explain why tomorrow evening. Let us have your feedback.